Eminent artist Jatin Das returns with an exhibition after seven long years to a city he loves. His new works, titled Figures in Motion will be presented by Art & Soul at the Jehangir Art Gallery from the 4 – 16 of October 2017. This new body of work exemplifies Das’ inexhaustible energy. His vitally shines through his powerful lines and his unending desire to explore human figures, beyond time and space. To understand Das’ work is to understand the artist himself. His artistic expression stems from a deep-rooted and honest interest in all that he interacts with. The effortless and sparse use of strokes immortalize his figures on the canvas. The silent melody pervades every work, regardless of the medium. He deftly captures ‘the figures in motion’ in his paintings, drawings and graphics. Deceptively calm, probably through his choice of colors. Over the last decade, his figures have only emerged as more resplendent, and as captivating as ever. Das says, “A lot of sweat and blood has flown under the bridge. I am a loner. I exhibit very little now, but I work everyday. I don’t use words like creativity, mood, inspiration. I feel everyday I am starting to paint for the first time. I paint and capture elements that excite me, assimilating from various visual cultures; traditional and contemporary. I draw mainly human figures, completely devoid of embellishments and any reference to time and space. They are simply energised bare figures, in motion. In my early days in Mumbai, when I was a student at the Sir J J School of Art, we were asked to submit ten sketches a day. By self-imposed discipline, I decided to do three hundred a day! At times I would make my left hand a model in different positions and sketch. I would often go to the zoo, drawing flights of birds and movements of animals. The sketchbook accompanied me everywhere. Even to dance performances, where in the dark, I sketched the dancer’s hands etching into space. 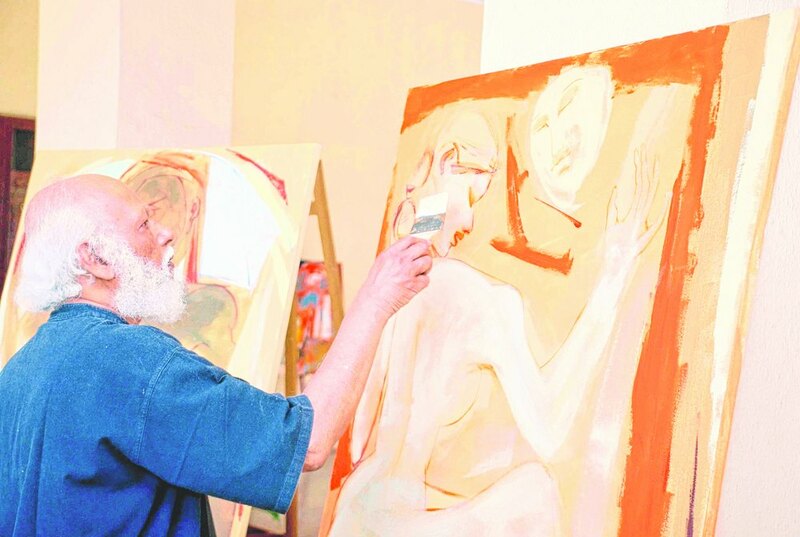 Jatin Das has been painting for almost 60 years. Born in December 1941 in Mayurbhanj, Odisha, India, he studied at the Sir JJ School of Art, Bombay, under Professor S.B. Palsikar. He has held 68 one-man shows, in India and abroad and has participated in numerous national and international exhibitions and artist camps. He works in oil, watercolour, ink, graphics and Conté. From his mural The Journey of India: Mohenjo-Daro to Mahatma Gandhi in the Parliament of India, to his welded steel installation at the Bhilai Steel Plant in Madhya Pradesh and most recently his mural at Bangalore airport, Das has worked with a wide range of materials and created several landmark murals and sculpture installations. His works feature in several public and private collections in India and abroad. He has lectured extensively at art and architectural colleges, museums and public forums, sharing his art and his understanding of contemporary and traditional art forms with wide audiences. His commitment to art and artists and towards creating a sensitivity for art and aesthetics led him to a dream almost 30 years ago. Jatin is the Founder and Chairman of the JD Centre of Art in Bhubaneswar, Odisha that will house classical, contemporary, traditional and folk art under one roof. During the last 35 years, he has built a personal collection of contemporary and traditional art, antiquity and crafts that includes the enormous ‘Pankha’ collection – which consists of more than 6000 hand-fans. In 2012, Jatin Das was the recipient of the prestigious Padma Bhushan award. Art & Soul is an art space in the heart of Worli, Mumbai and enjoys the privilege of working with a huge cross section of artists. Founded in 2004, art & soul is recognized by the artist community with uniquely conceptualized, interactive and well executed art events. This is reflected in their large database of artists and the gallery showcase of works of over 100 established artists, spanning 8 decades. The artist relations are fostered through reputable tie ups in the domestic and international art scenarios. art and soul’s responsibilities to their clients are met by raising art consciousness and awareness amongst primary investors, through consultations, workshops and dialogue with artists, art historians and art critics and through a unique format of social initiatives involving artists of different genres. The gallery shows Indian and international artists and also engages with public and private projects with architecture and Interior design companies. Over the years the Jehangir Art Gallery has served as the hub of a significant amenity in the city – a depository of contemporary art. Since it was founded in 1952, the institution has helped establish a platform and for the works of innumerable artists, an identity for their patrons and has brought art free of charge to the common man. The Gallery is now at the geographical centre of the Kala Ghoda Art District and thus has a pivotal role to play in the future.